One of the hardest budgets to cut is the food budget. Since food is a necessity, and since most families want to make healthy eating a priority, it can be a really daunting task. Being someone who loves to try out new recipes and has two hungry guys to feed, I was definitely a little nervous when I decided I was going to try to cut our grocery bill in half! We used to spend about $250 a month on food, give or take about $25. That’s a lot for three people! I didn’t realize just how much we were spending until I really sat down and looked at our receipts. Not only that, but a lot was going to waste. Fruits and veggies would go bad before we had a chance to eat them, leftovers were forgotten in the back of the fridge, yogurt would expire, the list goes on. In an effort to use as much of our food as possible while spending less, I decided to start really buckling down to figure out a method that would help us. Here are the steps I took to cut our grocery bill, cut down on waste, and keep eating well…all without the dreaded coupon binder! I usually come up with a basic meal plan for the week, in no specific order. Once I have done that, I jot down any ingredients I will need that we don’t already have. Make a list and check it thrice. 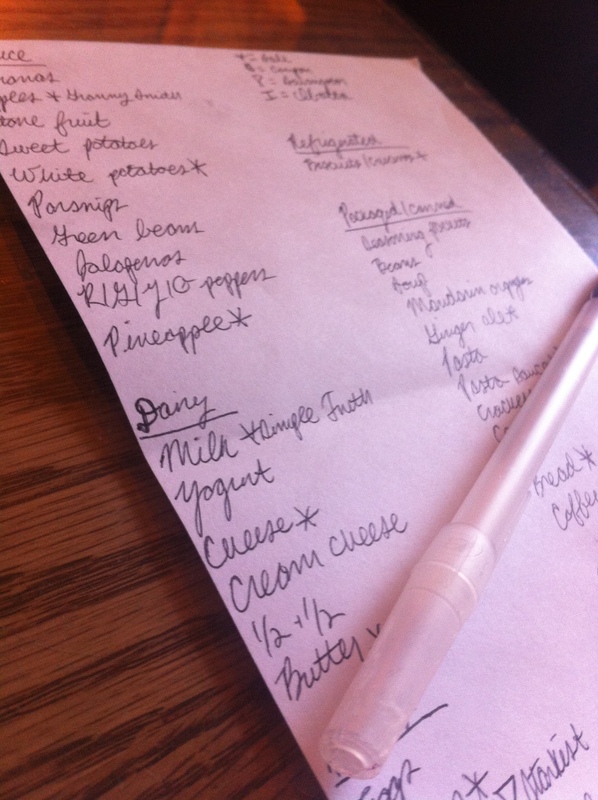 Shopping without a list is a recipe for disaster – I should know! I used to go shopping without a list all the time, thinking that surely I could be sensible and get us everything we needed. Yeah, right. I would always come in way over budget, buy far more than we needed, get a ton of extras that weren’t necessary, and forget the one thing I actually went in to buy in the first place. Always start by making your list, checking each section of your kitchen and home to make sure you didn’t forget anything. Then go through and see if there’s anything you don’t actually need (I am forever writing down “cherry pie” and then going back and scratching it off). Once I complete my list, I usually go back and rewrite it, dividing it up by store sections. It sounds a little obsessive, but it makes shopping with a toddler a lot faster and easier! It also makes it a lot less likely that I’ll forget something while I’m shopping, since my lists usually end up pretty messy by the end of the trip. I usually shop at Kroger, so I’ll use them as an example. I have the Kroger app on my phone in case I need to double-check anything in the store, but the ads are also available in print and online. Go through the ad and make a note of anything on your list that is also on sale. For example, if I want to buy yogurt and a particular brand is on sale, I’ll put a little star next to “yogurt” on my list and note the brand. If there are special sales, such as a holiday or mega event that offers a certain amount of savings for buying a specific number (such as “save $5 when you buy 10”), I’ll make a special note of any items I plan to buy that qualify. Sometimes, it’s worth buying a few extra bags of frozen veggies to get the savings! Once you know what brands you’re going for, it’s time to look for corresponding coupons. Check online, in the paper, and on your apps to see if you have any, and make sure to make a note on your shopping list for easy reference in case there is a problem. Be sure you check your coupons to see if there are specific instructions, such as the quantity you must purchase or the size of the qualifying item. After finding brand-specific coupons, look to see if any other items on your list have coupons available. I use SavingStar and Ibotta every time I shop. SavingStar simply requires you to link your store card and it will automatically issue your savings in the form of a rebate to your account. For instance, if I need to buy tuna at Kroger, I check SavingStar to see if they have any deals. There happens to be a deal for $4 back on $12 worth of StarKist, so I activate the deal. On Ibotta, you simply need to “complete” offers by reading quick facts or sharing the deal on Facebook in order to qualify for your discounts. If I need to buy coffee and Ibotta has a $0.50 deal, I simply have to “learn a fact” and share it on Facebook in order to qualify. After purchasing the item, I scan my receipt and the barcode of the coffee, then the money goes into my account. Obviously, this is a little different from using a coupon, but it is still money saved! As with coupons, I make a note on my list of which app is offering which deal and how much/what size I need to buy to earn it. Not all sales or coupons may be listed before you get to the store. While you’re there, be sure to keep a sharp eye out for better deals along the way. You may have a specific brand noted to be on sale and have a $0.25 coupon for it, but it may still be less expensive to buy the store brand. If an ingredient you need for one of your planned meals is still a little too dear for your taste, see if there is anything you can reasonably substitute. I love asparagus, but $4 for a bunch can be a little much – but green beans are a good alternative and are often a fraction of the cost. Make sure you pay attention at the register to be sure your discounts apply correctly. Even if it’s a store you don’t always shop at, having a loyalty card can only help you. They are generally free and many stores offer the bonus of discounts on gas – I saved $0.50 per gallon the last time I went to fill up! Not to mention that sometimes there are extra bonuses – catalinas (the coupons that print from the register), extra savings, the occasional discount you may have missed, etc. After I get home, I always scan my receipt into Receipt Hog. It is an app that awards “coins” for shopping at grocery stores, drugstores, wholesale clubs, Target, the list goes on. I have even gotten coins for scanning receipts from my local wine store! You can also earn the odd 10 coins here and there for taking brief (we’re talking 3-5 questions) surveys about your shopping trip or specific items you purchased. Once you reach 1,000 coins, you are eligible to cash out for $5 on PayPal or a $5 Amazon card. It is totally free and I highly recommend using this app. It only takes a second and an extra $5 here and there never hurt anyone. I occasionally buy extra veggies and meats if they are a good price. Anything I don’t plan on using right away goes straight into the freezer. I like to create blends of veggies for quick use in soups, stir-fry, fajitas, etc. so that I can stick to my meal plans, ensure we’re eating healthy foods, and save time. Once I make freezer meals or veggie blends, I put at least one on my meal plan for the following week. I also make a note of any coupons or app offers that I did not end up using, sales that will be continuing through the month, or items that I definitely do not need to buy soon (I sometimes store larger items, such as big packages of paper towels, in odd places for the sake of saving space, so I occasionally forget about them and buy more). If I earn a little extra in rebates, I often apply that money directly to my next grocery bill to cut down spending even more. I know this all may look a little overwhelming, but I promise, it’s really easy! I spend maybe an hour and a half total doing all of the planning now that I have gotten accustomed to this system, and our grocery shopping has gone from 4-5 trips a month (usually due to poor planning and forgotten items, which of course leads to some impulse buying) to 2, with the occasional produce run in between. It is totally worth the short planning time to get these savings – I cut my grocery bill in half the first month I did all of this, and I ended up with more food than usual with far less waste than before! If you’re struggling to figure out the grocery budget and you’re overwhelmed with couponing and all that goes with it, try my lazy system and see if it helps you. I’d also love to hear from others – what’s your grocery method? Excellent Post. Planning your meals is definitely the best way. If people take your advice they will surely save money.